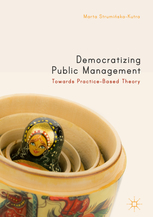 This book argues that contemporary society in general, and public administration specifically, can benefit from more reflexive learning processes through democracy and public involvement. It identifies the most central social practices, dilemmas, and challenges for public management as well as the mechanisms needed to enact institutional change. Offering a model of reflexivity and learning in the face of public dispute, it explores phenomena such as problem solving, democratization, public learning, and uncertainty to address certain tensions in governance theory and practice.